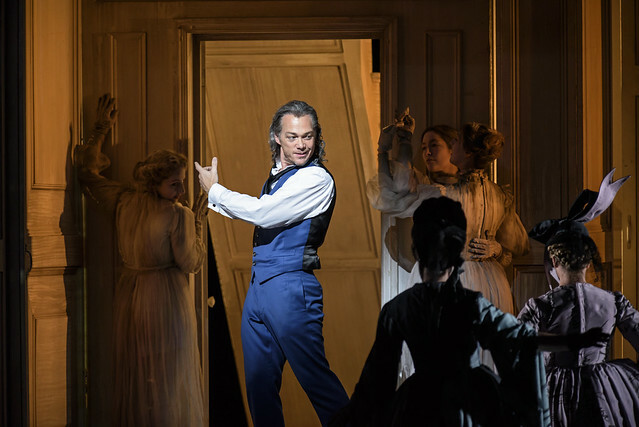 Kasper Holten's Royal Opera production of Mozart's iconic opera is live-streamed from 7pm BST on 3 July 2015. This stream is now over. Thanks to all who joined us to watch live. Join us for Don Giovanni, live from the Royal Opera House in London from 7pm on 3 July 2015. We will be streaming the performance on this page and the pre-show programme starts at 6.45pm BST. Please note that we are not able to offer an on demand catch up for this performance. Kasper Holten's Royal Opera production of Mozart's iconic opera stars Christopher Maltman, Rolando Villazón and Dorothea Röschmann. The production is also being relayed to BP Big Screens in squares and parks around the UK. Let us know your thoughts on the production and where you're watching from via Twitter with #ROHdongiovanni. Don Giovanni is staged with generous philanthropic support from The Danish Research Foundation. It is a co-production with Houston Grand Opera. Noooo, i just tested live streaming and was informed, in Germany this is not possible?? Do you know anything about it? Please, please help! In seeking to advise friends domiciled in Miami about the live streaming event tonight it would be helpful to know the steps they should take ( in laymans terms) to accomplish viewing., if indeed it will be possible for them to do so. I look forward to hearing from you . Many thanks. If they are watching through a computer they should just visit this page and press play to see it live at 7pm BST. As long as you have good broadband, set the quality to HD (button at bottom right of YouTube player) and also expand to full screen. Will this be archived on the Youtube channel the way some of the other live streams have been? Unfortunately we will be unable to provide a catch up on this occasion, so the stream will be online only. Sorry! Sorry Sue, I don't think that will work. Where was Mozart's epilogue? Surely he knew best how to end his opera! This leaves us feeling unsatisfied and a bit dizzy! Hi Chris, just got back from the live performance at the ROH. Wish I could have read your blog live as I thought I was thinking much the same, except I was obsessing how much the eyebrows guy looked like Mr Bean. And by the way, there wasn't a choc ice to be found at the ROH, only those posh little cartons you have to eat with a tooth pick. Thanks for an entertaining commentary. I just finished looking and listening to a DVD of the production of Don G. at the Met with Levine/Terfel I’m sure the music is still gorgeous but I can’t stomach the modern productions. Bryn Terfel’s don was the ultimate seducer - and his acting — especially with Leparello - cannot be surpassed. Why change a good thing?? ?